Sometimes those who lift up others need a helping hand themselves. That’s certainly the case for the folks at the Center for Restoration Ministries in Ruskin, a nondenominational church with the mission of saving lives as well as souls. From June 2015 through June 2016, the ministry served 996 adults and 1,034 children, the majority of whom were indigent or homeless. It was operating out of leased space in a building just south of the Ruskin Post Office and a block north of Shell Point Road. One side of the building housed The Cross, the ministry’s one-stop shop for food, clothing, personal hygiene items and more. The other side included the church sanctuary. But when the owner chose to sell the building in July, church leaders decided the ministry needed more space to accommodate future growth. At that moment, it became homeless itself. Shortly after, however, the Center for Restoration Ministries began renting space for worship services at Big Jim’s Storage on College Avenue in Ruskin. But the church has not been able to reestablish a center of operations for its ministry to the homeless. With both needs in mind, the congregation purchased one and four-tenths acres on Sixth Street Southeast in Ruskin to build a new sanctuary and community resource center. It now needs to raise $300,000 to pay off the land and construct the building. The new structure will be not only a church but also a center of compassionate outreach. Roberts has a heartfelt desire to help the poor and especially the homeless, many of whom he says are victims of circumstance. Roberts said the ministry provided the man food and clothing. “Homeless people come and go, so we want to be there for them when they come to us,” Roberts said. “We want to provide resources and a program to help them find a job, get temporary public assistance, proper identification and a place to live. “It’s more of a hand-up than a handout,” added Deacon Tremayne Freeman. The ministry currently supports two trailer communities of migrants and low-income residents in Ruskin, its primary area of service. But with community support it can and will do more to show the love of Christ to those in need. 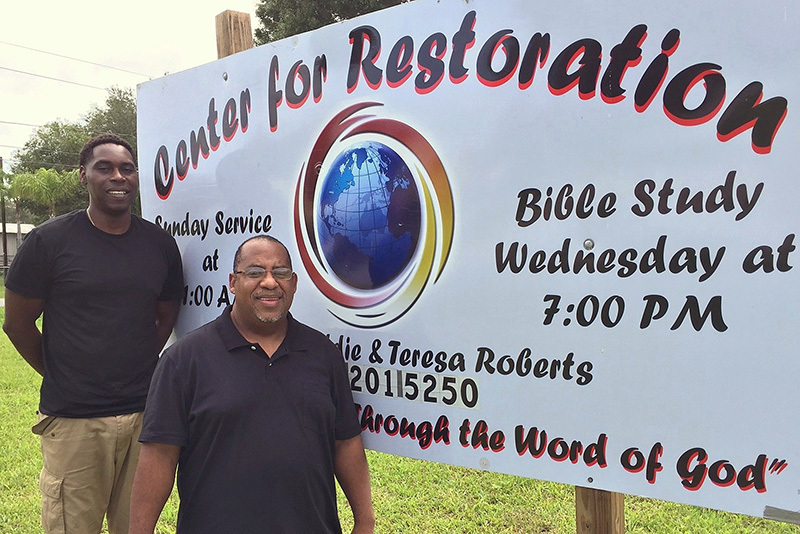 The church will host the Center for Restoration Ministries Gala at 6 p.m., Sept. 30 at the Hilton Garden Inn, 4328 Garden Vista Drive, Riverview. The fundraiser will include dinner, live entertainment and a guest speaker. Tickets are $100 and are available by calling 757-201-5250. If you’d like to help but can’t attend the gala, tax-deductible donations of any amount can be made payable to and mailed to the Center for Restoration Ministries, P.O. Box 684, Ruskin, FL 33575. Receipts are available, upon request. For additional information, email centerforrestorationinc@gmail.com or visit www.centerforrestoration.org.